I found out that putting something cold on my cheek makes my swelling go down and my toothache doesn't hurt as much. But how do you keep something cold on your cheek? 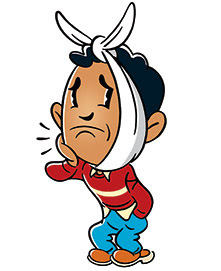 Tie an ice bag to your head, like in those old cartoons and movies? I have some cold compresses that are supposed to be for migraine headaches. They stick to your forehead and cool it down. So I decided to try one on my cheek. It worked! But I couldn't leave the house because it looked like I had a maxipad on my face!! 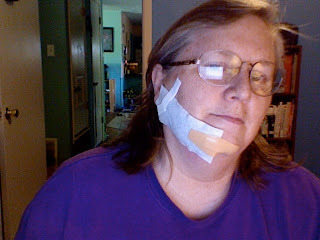 Also, it wouldn't sick real well, so I had to tape it to my face! First I thought of using a bandaid, then I remembered that I have some first aid tape. It helped, but man did I look silly!